In the past several years, chefs have taken quinoa from hippie to haute. Here are nine fantastic riffs. For an elegant take on quinoa salad, California chef Jeremy Fox thinly slices root vegetables on a mandoline, then chills them in an ice water bath until crisp. He then serves the wisps over lemony quinoa. Black beans and a spicy, smoky dressing come together with quinoa in a salad from Boston chef Ken Oringer that’s hard to stop eating. It can stand on its own as a meatless lunch. Simmering quinoa in a mixture of water and orange juice, as Las Vegas chef Kerry Simon does, gives it a great citrus hit. 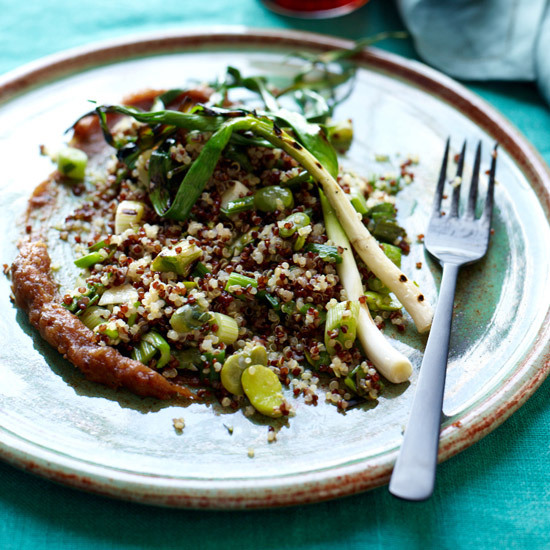 He then pairs the quinoa with tomatoes, roasted red peppers and plenty of herbs. California chef Charlie Parker mashes grilled dates to make a deeply flavorful sweet dressing for minty quinoa. Chef and cookbook author Yotam Ottolenghi pairs quinoa with chewy red rice to create a substantial, multi-textured salad that he studs with dried apricots and pistachios. F&W Best New Chef 2008 Giuseppe Tentori adds vinegary radishes for a puckery crunch in his salad. Quinoa might be the champion food of vegans, but that doesn’t stop Chicago chef Bruce Sherman from adding bacon to make a delicious, satisfying and smoky salad. The TV chef and co-host of The Chew pairs quinoa with cool-weather vegetables like radishes, lima beans and beans. Make quinoa a fun, crunchy garnish, as F&W Best New Chef 2014 Dave Beran does. Toast some of your cooled cooked quinoa over low heat until it starts to pop, then sprinkle over your salad.